Congratulations to Emerita Professor Sumie Jones! 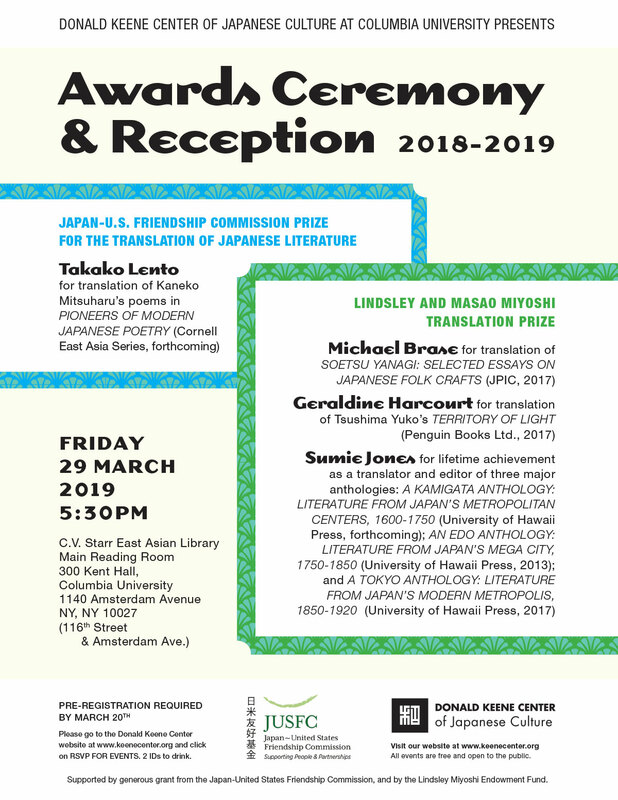 The Donald Keene Center of Japanese Culture announces winners selected by the jury for this year’s Lindsley and Masao Miyoshi Translation Prize. Sumie Jones for lifetime achievement as a translator, and especially for her work as a translator and editor of three major anthologies: A Kamigata Anthology: Literature from Japan’s Metropolitan Centers, 1600-1750 (forthcoming from University of Hawaii Press); An Edo Anthology: Literature from Japan’s Mega City, 1750-1850 (University of Hawaii Press, 2013); and A Tokyo Anthology: Literature from Japan’s Modern Metropolis, 1850- 1920(University of Hawaii Press, 2017). An awards ceremony will be held at Columbia University in New York City on Friday, March 29, 2019.